The Feathery Saga Of A 'Sucker For Unwanted Birds' Michelle Raffin's new The Birds of Pandemonium is an impassioned but occasionally jumbled memoir of her adventures in the noisy, smelly, exhausting, rewarding world of rare bird conservation. Did you know that the collective noun for a flock of parrots — akin to, say, a pride of lions — is a pandemonium? Apparently, Michele Raffin didn't know that either when she founded Pandemonium Aviaries — named instead for the chaotic, noisy nature of her "petulant psittacines" and "feathered vaudevillians." The apt name is characteristic of the serendiptious nature of what has turned out to be her life calling. The Birds of Pandemonium, Raffin's memoir about her unexpected odyssey into aviculture, does for rare birds what Susan Orlean's The Orchid Thief did for rare orchids, Joy Adamson's Born Free did for lions, and Jane Goodall did for chimpanzees and apes. After stumbling on an injured white dove by the side of a California highway in 1996, Raffin, a former Silicon Valley venture capital consultant, fell in love. Even before she became a breeder, her flock grew exponentially as she quickly earned a reputation as "a sucker for unwanted birds." Raffin introduces readers to the esoteric world of obsessive collectors and passionate protectors of endangered bird species. She explains how the Wild Bird Conservation Act of 1992 caused problems by drastically limiting the number of imported birds, which reduced fresh breeding stock. This caused breeders to concentrate on species at both ends of the price spectrum — parrots, macaws and cockatoos at the high end and budgies and finches at the low. Meanwhile, less desired and more difficult-to-breed rare pigeons and doves were cast off — giving new meaning to one of their many flock names, a piteousness of doves. Many landed in Raffin's care. Mostly, Raffin seduces us with entertaining stories of some of her fine feathered friends, anthropomorphizing them with names and personalities. Amigo, a small red-headed Amazon parrot, is a "perpetual toddler," a biter with a nasty disposition who always greeted Raffin's husband with a glare and an expletive. Sweetie, a small coturnix quail, taught Raffin to "speak bird" and understand his dietary needs, while Oscar, a shy Lady Gouldian finch who couldn't fly, "proved to be the resourceful architect of his own destiny" by instructing her to build a ladder he could climb in order to sleep safely and happily on a high perch. When half of a bonded pair of lorikeets died and the necropsy revealed that she was a he, it raised a dilemma for Raffin: Should she find a female or male partner for the male survivor? But how to find a gay male lorikeet? Raffin is on a mission with this book — not just to draw attention to her non-profit foundation to preserve species like the spectacular blue Victoria crowned pigeons, considered modern-day dodos — but to prove that they are more than just eye candy. "I intend to convince you that 'birdbrain' is the finest of compliments," she writes. "Our birds are gorgeous. But that's not why I've fallen for them so hard and so deeply. I've learned that their behavior is far more fascinating than their plumage." This occasionally jumbled but always impassioned book captures the "controlled chaos" on which Raffin clearly thrives. Among many other things, we learn that caring for birds is expensive, exhausting, smelly, and noisy. It's also a constant tug of war between emotion and reason and "involves a scary amount of guesswork." 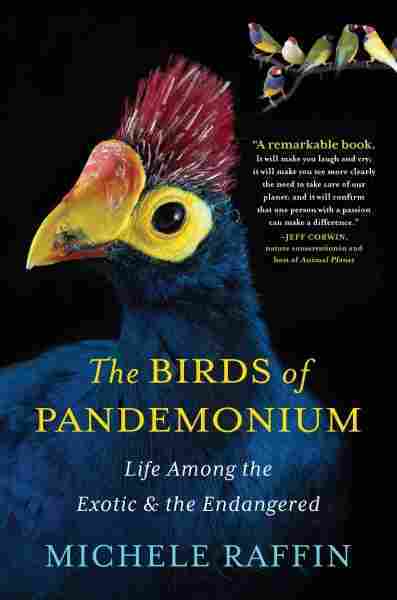 With vibrant photographs of its spectacularly plumed lead characters, The Birds of Pandemonium is a rich suet, seeded with both hearty information and delectable flights of fancy.